awww, thanks Jill! Penny was my reading buddy. She and I had a special connection. I hope you are awake when you arrive in MX! 😀 Have fuuun! Thank you Laura for my beautiful Kaiko drawing. The story of Penny brought tears, remembering all the wonderful little quirks out dear feline family have performed through out the years. Elisabet, I am so glad you love it! That means so much! Glad you enjoyed my story about Penny. She was a wonderful girl and we had a big connection. We had a deal….I’m pretty sure she will find me again. I will know when it happens….we had an agreement. Looking forward to that day coming. 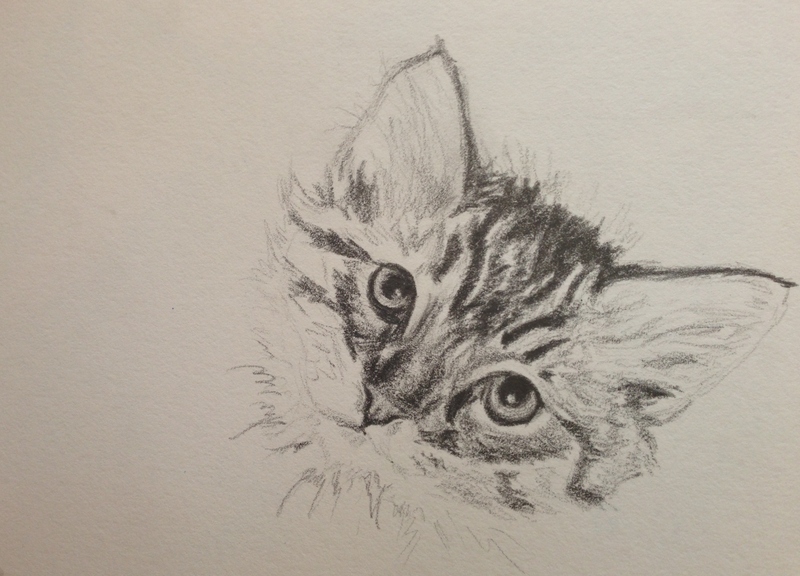 Anyway, so glad you enjoyed this sketch of your precious fur baby! I know how you feel, Saturn passed on the the rainbow in the sky in December 2015 he was 21. Awww so sorry to hear it. I have a friend who lost a really special kitty and he found her again ….. I’m hoping same goes for me, and for you, too! This is beautiful – I love it! OH HOW SWEET and BEAUTIFUL! Another one that belongs on our gallery wall!!! I can just feel your cat love in this drawing. And maybe get the feeling of missing sweet Penny…. 😦 So glad you showed up with a drawing today, buddy! Sending hugs! Great, Laura! Thanks so much for the beautiful drawing! What a little darling kitty, I just to reach out and give the kitty a pat. Beautifully sketched Laura, a drawing of love. Eeeek! So cute, Laura!!! Beautifully done. Such a sweet little face! Love it. Wow, what a precious face and the eyes, brings little Kaiko alive. Excellent sketch Laura. Thank goodness for pencil sharpeners. That is one beautiful kitty! ❤ I miss my cats but Son1 is allergic so I won't be able to have one until he moves out. Awww so cute, and same name as my cat ( one of them) Laura you are so good at cats, and thank you for the blog link, I will check out now. Thank you, Julie! I’m so glad you like it. Who can resist a reading cat ?! Thanks, Debi! I can’t resist a cat with a book! Her markings were challenging but the more I do them…..becomes easier. I start gravitating to the more challenging faces. Really enjoying the challenge! yes, its easy to get hooked, by a cat with a book. lol. I really liked your kitty, lovely face. and, it was alot like Merlin. Is Merlin a cat you know? Or you mean the fictional one? Do you have pics of him on your blog? How many cats do you have? Thanks, Rebecca! I’m so glad you like this. I’m feeling more confident, the more I do. Which makes sense lol. It’s fun, and the faces seem to be my favorite, of all the different types of subjects I’ve tried. Thanks for the encouragement! Awe, sweet kitty. I have a white JRT in my lap right now. He seems to be getting heavier as his breathing gets deeper…snoozy rainy day. This is quite adorable, Laura! I love Kaiko’s little eyes looking up so sweetly! Cute beyond words…your portraits are so touching and lovely. So cute :-). Love those heart melting eyes! Thanks! The photo gave me a huge leg up. This kitty is so sweet! Way to capture that gorgeous face! Love it! what a lovely touch you have, Laura. This is one sweet kitty!